When former Google software engineer Patri Friedman came up with the idea of building floating islands, he had in mind an unusual buyer: Libertarians, seeking freedom to live beyond the reach of governments. But his futuristic plan has now found a new, motivated and very different audience - small islands halfway around the world that are slowly being submerged by sea level rise. The Pacific nation of French Polynesia, looking for a potential lifeline as global warming takes hold, in January became the first country to sign an agreement to deploy the floating islands off its coast. "Dreams belong to those who want to move forward and make them happen," said Jean-Christophe Bouissou, the country's housing minister, at a San Francisco ceremony where he inked a memorandum of understanding with The Seasteading Institute . The institute - the name combines combines "sea" and "homesteading" - is the brainchild of Friedman and Silicon Valley investor Peter Thiel, who helped found it and initially pumped more than $1 million into the floating islands project. He is now no longer involved in the institute, but Friedman is taking forward the project. With its possibility of creating new floating nation states, it has won converts among libertarians, whose ideology argues that greater freedom makes people thrive, said Doug Bandow, a senior fellow at the Cato Institute, a Washington D.C.-based libertarian thinktank. But the possibility of keeping a sinking nation afloat clearly presents another opportunity for the technology, he said. "If (island nations) feel threatened by the rising sea ... they might view this as being the best option for their people," Bandow said. "Obviously, living on a seastead is very different from even living on an island. Nevertheless, if you figure there's going to be relocation, maybe this is a better option to stay in the region as opposed to having to literally move en masse to another country," he said. Low-lying, small islands of the Pacific are disproportionately at risk of losing land as sea level climbs by an expected 10 inches to 32 inches (26-82 cm) by the late 21st century, according to the U.N.'s Intergovernmental Panel on Climate Change. In a 2013 study of more than 1,200 French-controlled islands, researchers at the Paris-Sud University found that French Polynesia and the territory of New Caledonia, also in the South Pacific, were most at risk of seeing their islands entirely submerged. Bouissou, of French Polynesia, says he sees in floating cities the kind of outside-the-box thinking that could solve such a problem. "There are very few people that have this kind of ability to be forward looking," said Bouissou in a telephone interview. Many among his country's 270,000 residents have in the last two decades already begun seeing their houses more frequently flooded, he said. Under the terms of the deal with French Polynesia, The Seasteading Institute will first study the project's economic and environmental impact, at the institute's own cost, said Joe Quirk, a project's spokesman. If the study looks positive, the institute will try to raise investment to put in place three solar-powered pilot platforms, each roughly 165 by 165 feet (50 by 50 meters), Quirk said. Under the plan, the islands - likely to be located inside a lagoon near French Polynesia's Tahiti - would be made a "special economic zone", in the hope of attracting tech companies, he said. "I expect French Polynesian and foreign people to live there and commute there for work, and schoolchildren to take class trips there," Quirk said. One rendering shows a floating island dotted with palm trees and supporting a multi-story building designed to resemble French Polynesia's national flower, the Tahitian gardenia, said Quirk. Sailing ships are docked in calm waters, just footsteps from an inviting beach, the drawings by Dutch engineering firm Blue21 show. The islands' engineering details remain to be developed, Quirk said. But in a 2013 study commissioned by the institute, Dutch design firm DeltaSync concluded that the artificial islands could best withstand the ocean's elements as modular platforms that can be connected and arranged in branch-like structures. Construction of the islands, which the institute hopes to fund with investor cash, could cost between $10 and $50 million and begin as early as 2018, Quirk said. The institute is in the process of recruiting investors, he said. "We're not going ask for any money (from French Polynesia). We're just going to ask for permission, legislation. And if it fails, we absorb the risks. We'll disassemble and move on," Quirk said. The vision of floating cities has drawn some skepticism. Michael Gerrard, director of the Sabin Center for Climate Change Law at Columbia University in New York City, warned that such technological initiatives could divert attention from dealing with the root causes of climate change. "The caution I have is that sometimes people advance futuristic ideas of this sort as a way of saying climate change isn't so bad because if it happens we'll find a way around it," he told the Thomson Reuters Foundation in a telephone interview. "Clearly, the most important thing that can be done is to control greenhouse gas emissions so that these islands are not submerged." Alexandre Le Quéré, a radio host for station Polynésie 1ère in French Polynesia, said that in his view the floating island project had yet to get most citizens fired up. The repeated scaling back of another mammoth project - the holiday resort Mahana Beach, aimed at spurring the tourism industry - has left a bitter taste in the mouths of French Polynesians, he said in an online interview. 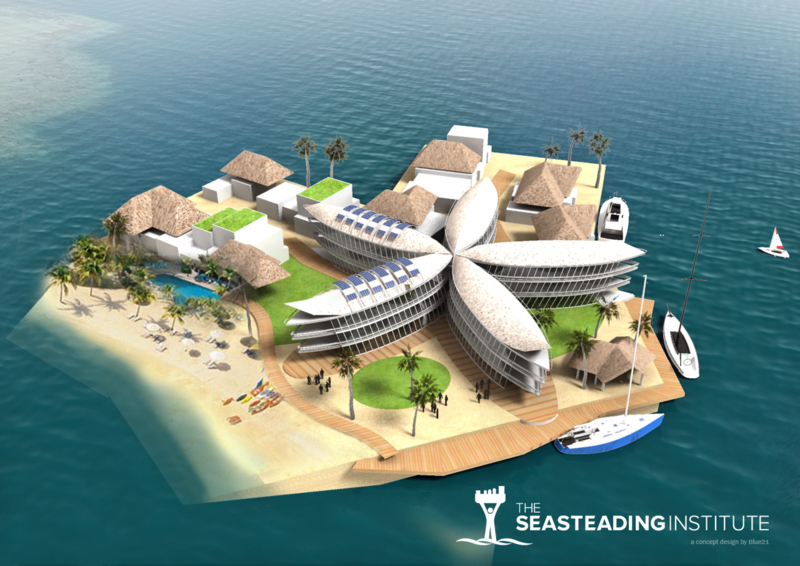 An initiative by The Seasteading Institute to establish a floating island community off the coast of Honduras was delayed in 2015 due to political unrest in the country, Quirk said. But the institute remains optimistic about resuming its project there, he said. The French Polynesian initiative is in a stronger position to succeed, he said, in that the institute has for the first time secured an agreement with a host nation. That one factor could be key, said the Cato Institute's Bandow. "If you can start finding governments that are willing to at least contemplate an arrangement - if you get one of them working somewhere - then suddenly it makes the whole enterprise look a lot more practical," he said.